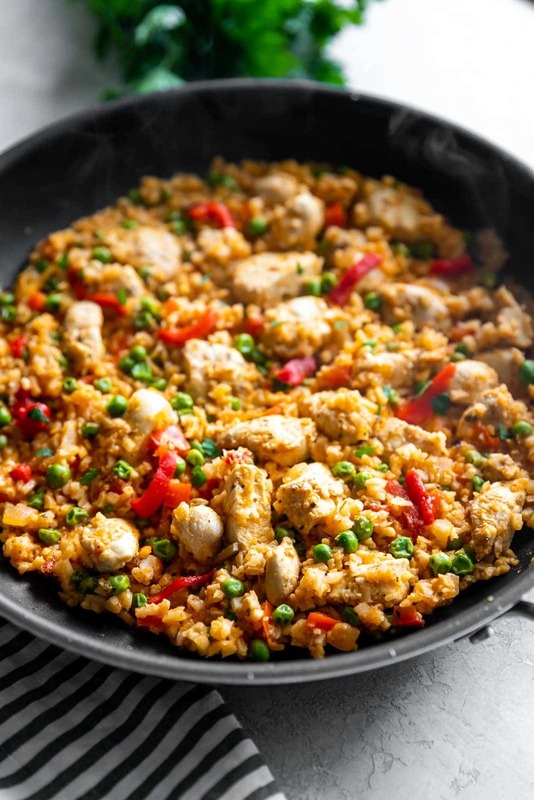 Classic arroz con pollo gets a low-carb makeover by using riced cauliflower instead of rice! Quick + flavorful weeknight meal for any day of the week! Almost every Sunday growing up, my mom would make arroz con pollo (Cuban-style chicken + rice). 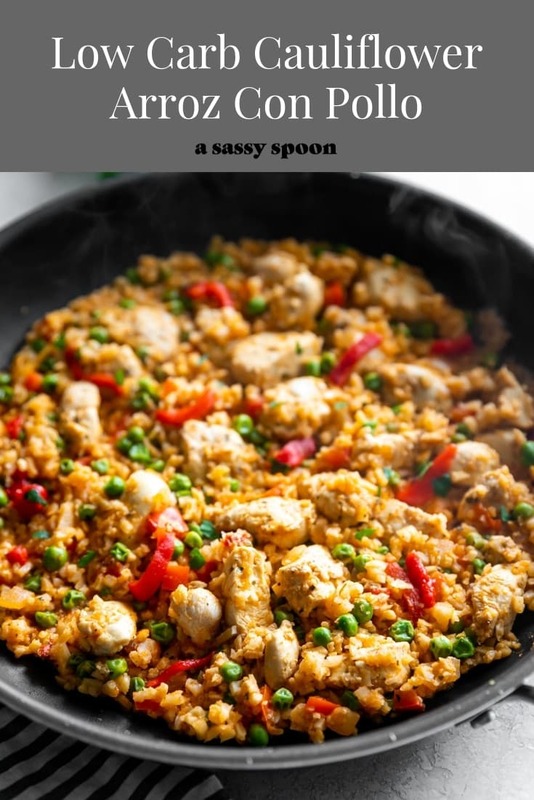 Arroz con pollo was a staple in my Cuban family and became almost like a special occasion type of meal. I would see my mom make a big ol’ pot of arroz con pollo for the family. It always smelled cozy and warm and, the dish was full of intense flavor. Every time she invites us over for arroz con pollo now, it always feels like my childhood. With that in mind, I wanted to turn this classic recipe into a quick, weeknight meal. A flavorful meal anyone can enjoy on any day of the week. Because why should we limit ourselves to just Sundays?! Also, I’ll never frown upon rice (my family would disown me and let’s be real, it’s delicious), but turning this classic into a low carb option by adding cauliflower rice was a good idea. Now, my family and I won’t feel guilty for enjoying a part of our upbringing on a weeknight! Shop This Recipe At Publix! 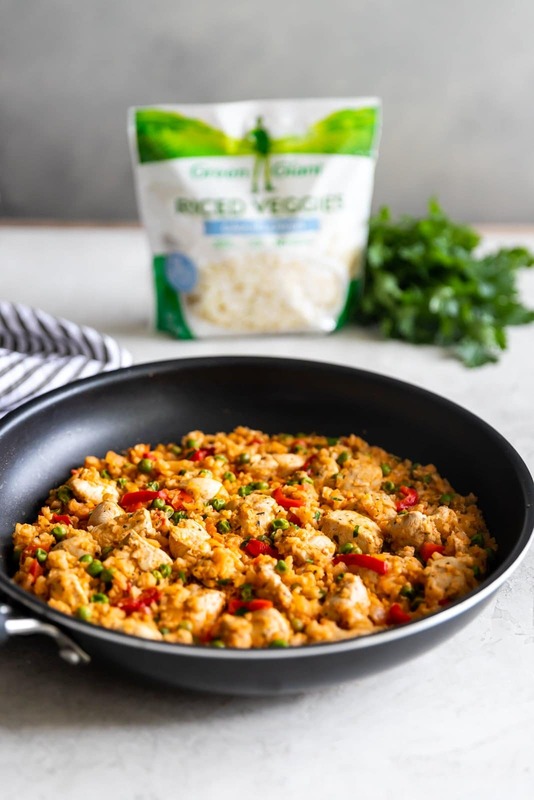 To bring this weeknight cauliflower arroz con pollo recipe to life, I used a bag of Green Giant Riced Veggies that I purchased in the frozen aisle at Publix, my favorite grocery store. Publix is one of the reasons I could never move out of South Florida! Their stores are always clean, staff is always helpful, and shopping truly is a pleasure. As a food blogger, I buy a lot of groceries, so I make sure to take advantage of all the sales at my nearest Publix. With that said, if you visit Publix between March 16th and March 29th, you can take advantage of their Cool Foods savings on several favorite frozen and dairy products. The Green Giant Riced Veggies are on sale for $2.59 for a 12-oz bag. Publix always has everything I need for cooking at home at affordable prices. As a matter of fact, you can find everything for this recipe at Publix! Click here to see a list of participating products with Cool Foods savings! I know what you’re thinking. 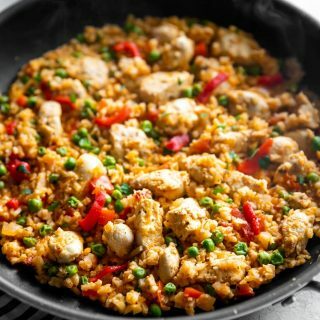 WHY on Earth would I make arroz con pollo with cauliflower rice?! I know, I know. Cauliflower rice has a reputation for not being the tastiest. But listen, don’t worry, you won’t notice the difference in this recipe. I made sure to use all the same ingredients in this recipe that make Cuban-style arroz con pollo taste amazing. You will be surprised at how good this tastes! Here’s what I did. I heated some olive oil in a skillet with chopped onions and garlic. I cooked that for about 1 minute or so. Next, I added the chopped red pepper and chicken breast. I cooked that for 5 minutes until the chicken was almost cooked. It’s ok if it’s a little pink; it will continue to cook as you add the rest of the ingredients. Now we’re ready for all the good stuff. Add the tomato sauce, chicken broth, peas, pimientos, oregano, cumin, salt and pepper. Mix it up, then add the Green Giant Riced Cauliflower. You will see the cauliflower change to a red-orange color. That’s what you want! Bring to a boil, then reduce heat and simmer for 5 more minutes. That’s it, guys! How easy was that? It’s a super flavorful, low-carb option that I know you will add to your rotation. In a skillet, heat olive oil over medium-high heat. Add onion and cook until translucent about 1-2 minutes. Add garlic and sauté for about 30 seconds. Stir in tomato sauce, chicken broth, peas, pimientos, oregano, cumin, salt and pepper. Add Green Giant Riced Cauliflower and mix to combine. Bring to a boil then reduce heat to medium. Simmer uncovered for 3-5 minutes until fragrant and chicken is cooked through. Serve and enjoy!